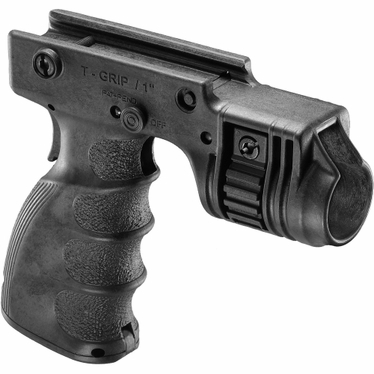 This unique tactical grip allows the operator to mount a 1" tactical light or laser with an on/off trigger located in the grip itself. No need for fragile, expensive pressure switches or wires. Safety switch prevents accidental activation of light. Ergonomically designed vertical foregrip has storage compartment for batteries, cleaning kits, etc. Mounts with a quick release for instant safe use off the weapon. Additional locking screw for more permanent installation.